It's Time You Stopped Losing Sales Opportunities And Client Referrals. Your business needs a consistent marketing communication's tool that keeps your database of clients and prospects in tune with the value your business brings to the marketplace; a process that builds trust, credibility, and brand recognition for you. Does your business need a high-value marketing system without breaking the bank? If it does, click on your industry link below to investigate how we can help your business get noticed and stay noticed in the marketplace. Our #1 Goal Is To Help Increase Your Sales. Period. 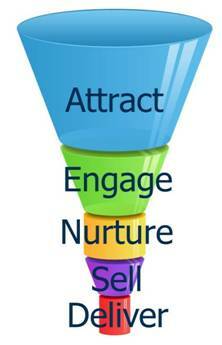 That's right; our #1 goal is to generate more sales leads and client referrals for you. We do this by sending compelling marketing messages, on a consistent basis, to your database of clients and prospects. If you want to improve your marketing efforts, then we invite you to learn more about our drip marketing "done-for-you" packages - campaigns that are chock-full of professionally written content to help your business nurture its relationships and drive in sales leads and customer referrals. We automatically provide you with industry articles and engaging content to deliver sales leads and customer referrals. Our e-mail platform partner, Constant Contact, will provide you a personal dashboard to view click-through activity and lead submissions - which makes tracking warm leads easy for greater follow-up. Our automated line of e-mail marketing campaigns allow you and your staff to focus on revenue-building activities. Not only do you receive an easy-to-use e-mail platform, everything can be edited by you. You also get the unlimited sending of e-mails to help build your digital marketing brand in the marketplace. The biggest challenge in deploying an e-mail marketing strategy is the consistent delivery of content - content people actually want to read. With our award-winning content, our editorial team will eliminate the "scheduling dilemma" by automatically scheduling your marketing campaigns to the appropriate database(s) of clients and prospective clients.